Every November, men around the world abstain from shaving to raise awareness of men’s health issues. “Movember,” or “moustache November,” is now a global sensation, raising millions of dollars for awareness since it began over a decade ago. It wasn’t always this way. Take a look back thirty years and you will find a slew of sailors with facial hair. The United States Navy has a glorious history of facial hair, sideburns, beards, and mustaches dating back to the War of 1812. During the American Revolution, many sailors opted to keep their faces free and clear. Many prominent sailors like John Barry and John Paul Jones chose to keep their appearance nice and neat. Sailors too tended to maintain a clean-shaven appearance, despite the lack of uniformity in dress between the Continental and state navies. The resurgence of hostilities with Britain in the early 19th century breathed new life into a fledgling and economically strapped Navy. Many of our best-known naval officers like Stephen Decatur and David Porter opted to grow glorious sideburns during their service during the War of 1812. Many of their British counterparts also chose to adopt the sideburns. 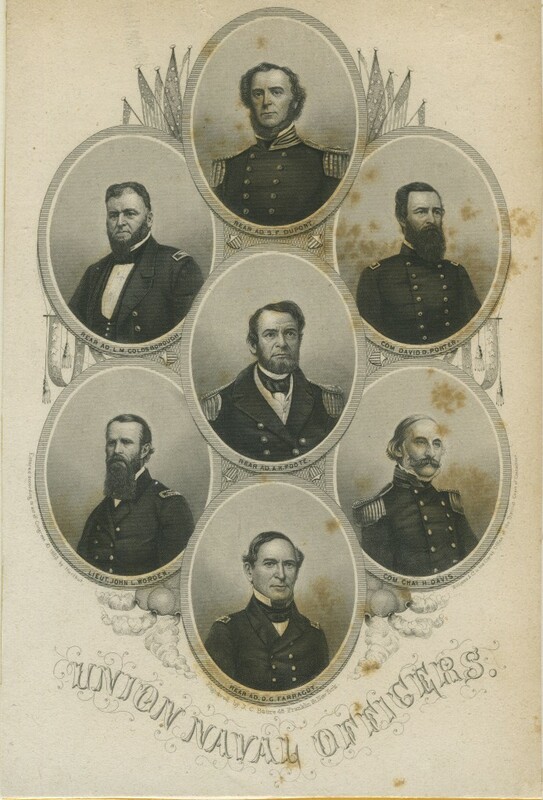 Many of these officers wore borderline muttonchops, such as USS Constitution Captain William Bainbridge, whose signature ‘burns and disheveled hair became a hallmark of his rakish figure. By the time the Mexican American War began in the 1840s, many of the young Wars of 1812 sailors like Robert F. Stockton grew elaborate mutton chop sideburns. Many officers and sailors in the United States Navy were unafraid to grow facial hair on the sides of their face. At this point, nobody had bridged the connection between the sideburn and the moustache, the critical element to make a beard. That is, until the Civil War happened. The American Civil War was a time of massive change in technology, tactics, and of course facial hair. Never before was there more facial hair in the military, for the Army and the Navy. You can blame it on long and tedious blockade duty or the style of the day, but the maintenance of facial hair in the United States Navy was bigger (and better) than ever. 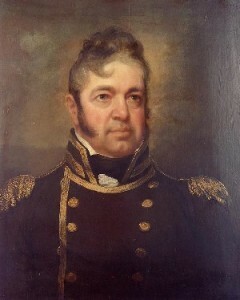 It was almost UNCOMMON for you to be a naval officer without facial hair. If you look at the image above, the only officer who doesn’t possess facial hair is Admiral Farragut. The rest of the officers run the gamut of 19th century facial styles: chin curtain (DuPont), Shenandoah (Goldsborough), beard (Porter), chinstrap beard (Foote), beard + long goatee (Worden), muttonchops + neck beard + moustache (Davis). The above photo of the USS Malvern is another interesting image. 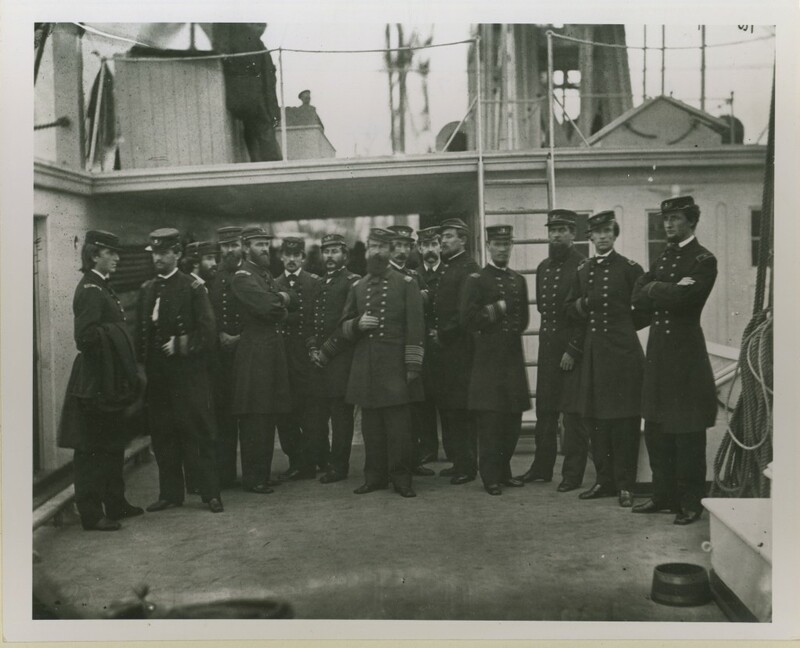 This is an excellent shot of Rear Admiral Porter and his staff in December 1864. You will notice almost everyone on his staff is sporting some sort of facial hair. Can you spot the only officer noticeably clean-shaven? Look to the far left, and you will find LCDR William B. Cushing, the young officer who just two months previous sank the CSS Albemarle. Officers of the Confederate Navy such as Raphael Semmes chose to sport a trimmed and aristocratic handlebar mustache reminiscent of Salvador Dalí. Officers of the late 19th and early 20th century abandoned the full facial beards of the Civil War area, opting instead for the more refined moustache and goatee. George Dewey is one notable example. 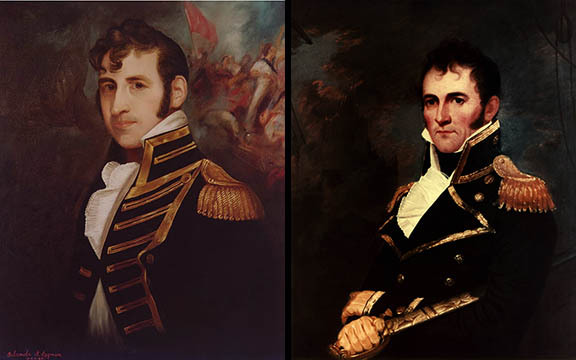 In fact, both major naval heroes of the Spanish American War, Admirals Sampson and Schley, both sported similar styles. Sampson is sporting a “German goatee,” which was all the rage with many military officers in the late 19th and early 20th centuries. 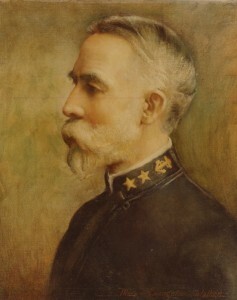 Notable author and Admiral William Sims served the First World War with a full white beard, one of the few to do so. During the Second World War, there was a great switch in the character and nature of facial hair growth. Much of this post reflects the beard history of officers. During WWII, most naval officers opted for the clean-shaven look. 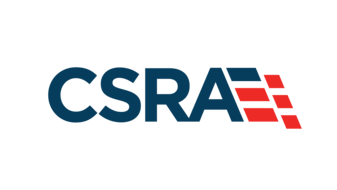 Enlisted sailors were much more lax in their standards, especially for submariners. Although all beards and mustaches had to be kept trim, they were often encouraged on submarines for its use in saving water. In other branches, the prohibition of facial hair was largely due to the necessity of wearing gas masks. Only a moustache could suffice. Radical changes to the rules and regulations behind facial hair did not change until Admiral Elmo Zumwalt stepped in as the 19th CNO in 1970. Love him or hate him, Zumwalt was an innovator in every sense of the word. 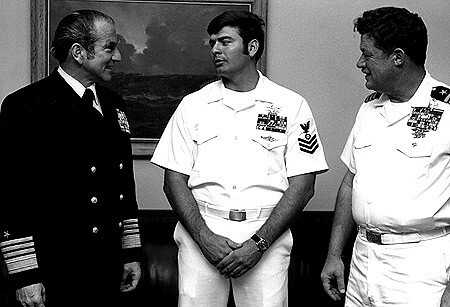 Zumwalt issued a series of Navy-wide communiqués called “Z-Grams” throughout his tenure. 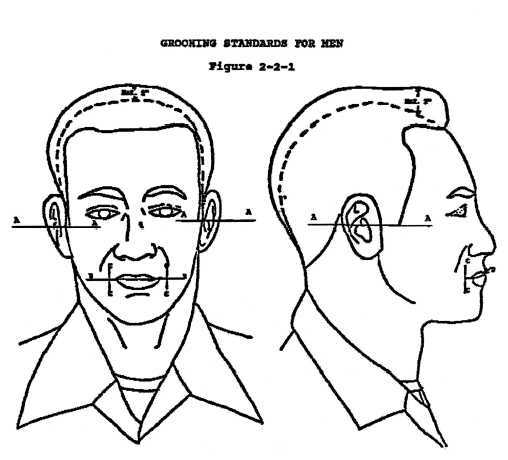 The most famous of these is arguably Z Gram #57, aptly titled “Elimination of Demeaning or Abrasive Regulations.” This document eschewed the “mickey mouse” policies of his predecessors, including the wearing of facial hair and beards. According to the Z-Gram, Zumwalt felt “we must learn to adapt to changing fashions.” The CNO himself had a nice set of sideburns, worn at the mid lobe (the farthest you could go). The official ban of beards on naval installations and vessels (including subs) came about in 1984 under CNO James D. Watkins. As many Cold War submariners will tell you today, that order was often ignored. The order remains the same to this day, with some exception given to moustache and some beard growth (Navy Seals/Special Forces). Do you have an interesting story about your Navy beard or facial hair? 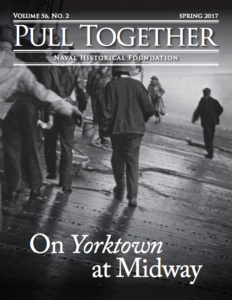 Send them to meng@navyhistory.org or post in the comment section! Thanks for the fascinating piece about beards and facial hair in the Navy. 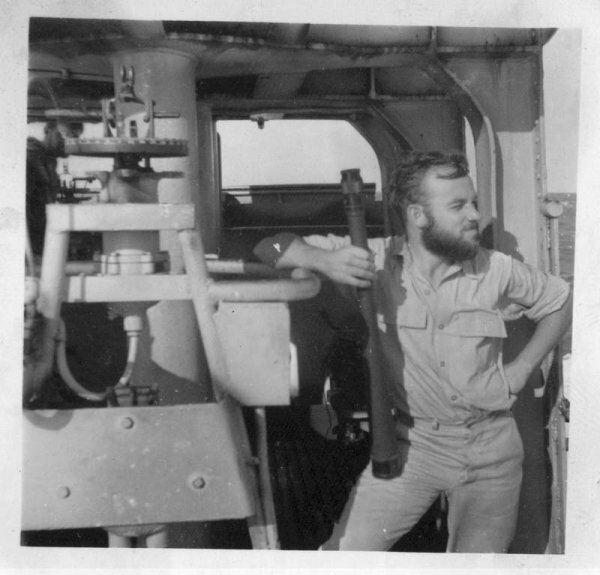 I’ve worn a full beard for most of my life – but not when on active duty in the early 60s. 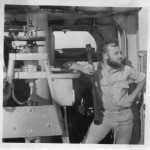 In the late 70s, when facial hair – among other Zumwalt-driven reforms – was still controversial among naval men, I spent a year teaching at the Naval War College. I quickly got the nickname “Fidel” from my students – older and younger alike.